Please note that the new term for the project leader shall start on April 17th, 2004. The ballot can be received through email by emailing ballot@vote.debian.org with the subject leader2004. Some statistics are being gathered about ballots and acknowledgements periodically during the voting period. Additionally, the list of people who have voted is available. The tally sheet is also present. All three of these proposals require a simple majority. I would like to thank Branden Robinson and Gergely Nagy for their service to the project, for standing for the post of project leader, and for offering the developers a strong and viable group of candidates. Total unique votes cast: 482, which is 52.908891% of all possible votes. In the following table, tally[row x][col y] represents the votes that option x received over option y. 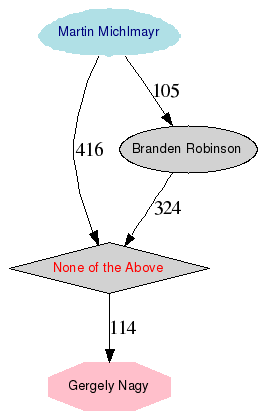 Option 4 "None of the Above"
Looking at row 2, column 1, Branden Robinson received 385 votes over Gergely Nagy. Looking at row 1, column 2, Gergely Nagy received 55 votes over Branden Robinson. Option 2 defeats Option 1 by ( 385 - 55) = 330 votes. Option 3 defeats Option 1 by ( 438 - 29) = 409 votes. Option 4 defeats Option 1 by ( 258 - 144) = 114 votes. Option 3 defeats Option 2 by ( 287 - 182) = 105 votes. Option 2 defeats Option 4 by ( 394 - 70) = 324 votes. Option 3 defeats Option 4 by ( 442 - 26) = 416 votes.